John Erskine was the leading evangelical in the Church of Scotland in the latter half of the eighteenth century. Educated at Edinburgh University, he learned to appreciate the epistemology of John Locke and other empiricists alongside key Scottish Enlightenment figures. As a clergyman, he integrated the style and moral teachings of the Moderate Enlightenment into his discoJohn Erskine was the leading evangelical in the Church of Scotland in the latter half of the eighteenth century. Educated at Edinburgh University, he learned to appreciate the epistemology of John Locke and other empiricists alongside key Scottish Enlightenment figures. As a clergyman, he integrated the style and moral teachings of the Moderate Enlightenment into his discourses and posited new theories on traditional views of Calvinism in his theological treatises. While widely recognized as an able preacher and theologian, Erskine's primary contribution to evangelicalism was as a disseminator. He sent countless religious and philosophical works to correspondents like Jonathan Edwards so that he and others could learn about current ideas, update their writings, and provide an apologetic against perceived heretical authors. Erskine also was crucial in the publishing of books and pamphlets by some of the best evangelical theologians in America and Britain. Within his lifetime, Erskine's main contribution was as a propagator of an enlightened form of evangelicalism. While there is a great deal of scholarship on Jonathan Edwards and John Wesley, Yeager argues that it is time to expand the scholarship of eighteenth-century evangelicalism by turning to one of their lesser-studied colleagues. 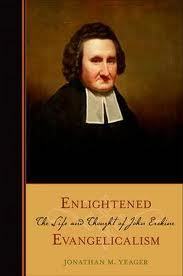 In this new biography of Erskine, Jonathan Yeager lays out the life and thought of a hitherto under-researched - yet, in his day, widely respected - preacher and gives Erskine the scholarly treatment that he so richly deserves.